There are plenty of things that are great about the winter months, snuggling up inside, drinking lots of hot chocolate and the chance to wear big snuggly jumpers. Whilst these things are amazing, there are plenty of things about winter that you probably won’t look forward to quite as much. One of these is the impact that the winter can have on your hair and scalp. Winter’s hair is a real problem and here at Aer Blowdry Bar, we know that it can be hard to know exactly what to do when your hair is not quite looking its best. To help you to take proper care of your hair and scalp over the winter, we have put together some of our top tips that you can try out for yourself. One of the first things that you should try to do is to keep your hair protected from the elements. We all know that hot weather can make your hair frizzy, but the cold weather can really have an impact on your hair and your scalp too. Of course, the easiest way to keep your head protected is to wear a hat, but this comes with its own issues. Hats that are too tight can restrict the flow of blood to and around your scalp, as well as causing your scalp to become sweaty, irritating it. It doesn’t matter the season, one thing that you should always make sure you do is to drink plenty of water. 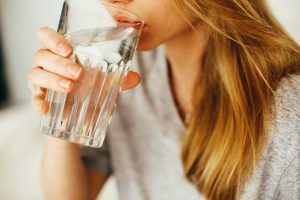 During the winter it can be all too easy to forget just how important your water intake is, however, you really need to remind yourself to keep on drinking. Otherwise, your poor scalp is going to become dehydrated, dry and possibly flaky too. Money can be tight during those first few months of a new year, which means that often those things that we don’t deem as a necessity are forgotten about. Such as having your hair cut. Haircuts are incredibly important and are something that you should not forget about. A regular trim makes sure that your hair is always in good condition and puts less pressure on your scalp too, which is going to make everything feel and look better all round! When it is cold outside, you are going to want to warm up with a hot shower or bath. However, when it comes to washing your hair this is the worst thing that you can do. Hot water will damage your hair and can cause irritation to that delicate scalp area, which means that both will start to be past their best. It is much better to try and wash your hair with warm or cool water as this will limit the damage that can be caused to them. We all like to have clean hair, but sometimes frequent washing is going to have a huge impact on your hair and scalp. This is because it removes all the natural oils from your hair. Of course, you do need to wash your hair if you don’t want to end up a greasy mess. But you should aim to wash it every 2 or even 3 days. Hat hair is not attractive, flat, limp and lifeless hair can make you feel a little sad when you are already feeling glum on a winter’s day. The good news is that there are things that you can do to try and revive and refresh your hair. Dry shampoo is one of the best lift me ups for your hair during winter months. All you need to do is spray it into the roots of your hair, which will keep your hair full and give it back some oomph. When the weather is cold you need to make sure that your hair is dry before you leave the house, however, if you can, this should mean that it is air dried rather than heat styled. 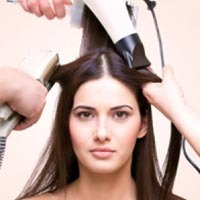 Heat styling is unavoidable sometimes, but if you can, let your hair dry naturally in the air. This will make sure that all the natural oils and moisture are kept in your hair where it needs to be. It is important for us to look after our skin, not only in the summer but in the winter too. This means that you need to use the right products to keep it at its best. The same is true for your hair. You can use a good quality shampoo and conditioner to give your hair a treat, but if you really want your hair to feel better, then you might want to come and book in to see us. Here at Aer Blowdry Bar we have the right techniques, products and knowledge to ensure that your hair feels, and looks amazing. No matter the season. So, there you have it, our top tips for making sure that your hair looks amazing throughout the winter. Whilst we can’t promise you that you will have beautiful weather, what we can promise is that your hair will feel great.